Do you avoid quilt math at all costs? Are you a quilter with a collection of patterns, that don’t fit the quilt you want to make? Maybe you love quilt math, but wish it could be a bit easier? Do you want to design your own patterns, but have trouble getting the math right? You love to piece quilts, right? Let’s make the math less of a headache! Over the last five years, I’ve written four books, and a pile of patterns for magazines, collaboration books, patterns, and tutorials. I’ve always enjoyed math, but it wasn’t until I developed a system that I really had fun doing quilt math. In the past I’ve had piles of papers with math all over them, and I would boil it down into a cut list like the one shown below. It worked but it wasn’t always pretty! My most recent book, Think Big, features charts so that you can make any size project for your home, which has had a great response so far, and got me thinking… How can I really make quilt math accessible to quilters everywhere, and allow you to explore your creativity without the headache of the biggest math story problem ever? 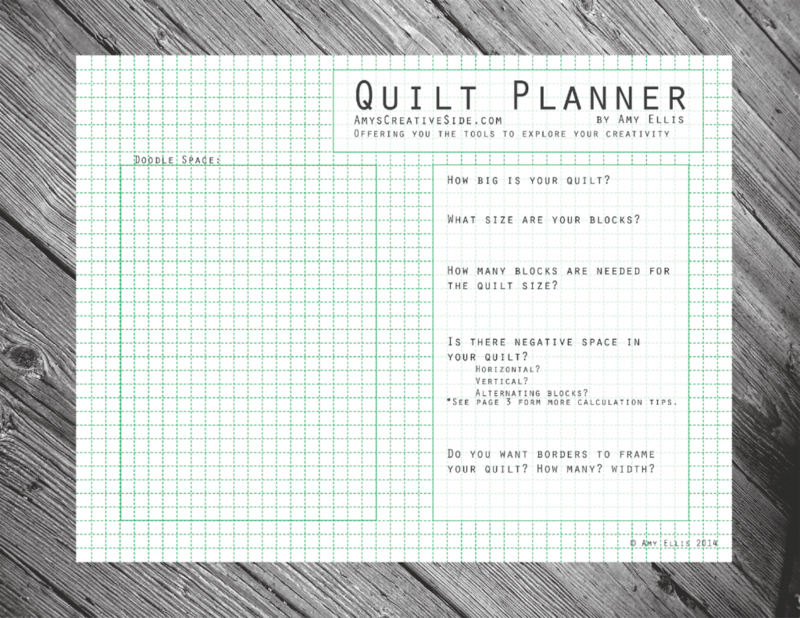 The Quilt Planner is a 5-page pdf document that you can print for each and every quilt you make! 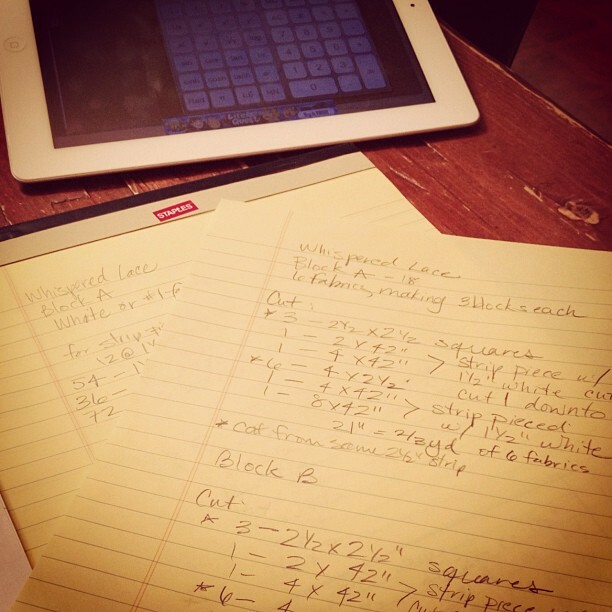 I walk you through a progression of questions that help you plan your quilt. Each detail in the block is covered, and I practically enter the info into the calculator for you! With each question, you will do a little math to determine the yardage required to make your quilt, and make a separate list to take to the cutting mat when you are ready to cut. There’s also notes on negative space in your quilt, and how to calculate the yardage, a list of suggested quilt sizes, and binding calculation. Finally, there’s a blank page for you to doodle and dream up your next quilt! As a quilter – The Quilt Planner offers you a whole range of options as you look through your current collection of patterns. You can adjust the number of blocks and the quilt size to make the quilt that fits your desires. As a quilt math lover – The Quilt Planner is a tidy way to plan your next quilt. As a pattern designer – The Quilt Planner will keep you organized, and your notes will be much easier to reference for pattern writing. Are you ready to take your creativity into your own hands, and make the quilt you’ve been dreaming about? It’s not that easy for me! I’d still mess that up! I put together a video to show you how I’m using the Quilt Planner. Hopefully that answered enough of your questions, and gave you the confidence to try it out! Use #quiltplanner in social media to tag your pictures of the Quilt Planner in use. **The Quilt Planner is not intended to replace your quilt patterns, rather it gives you the opportunity to customize the quilt you want to make, from already published patterns, or traditional blocks easily found online. 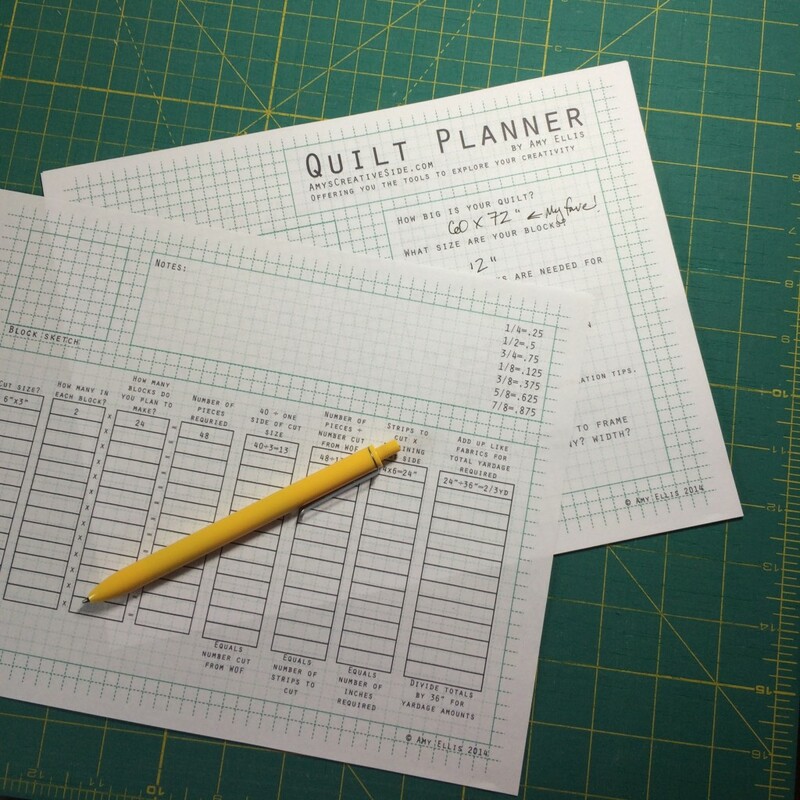 Coming up : I have plans to release smaller worksheets to accompany the Quilt Planner! I will help you to design your own blocks, resize your favorite blocks, give you layout suggestions, and calculate the backing fabric. To be among the first to know about these releases – sign up for this special newsletter!